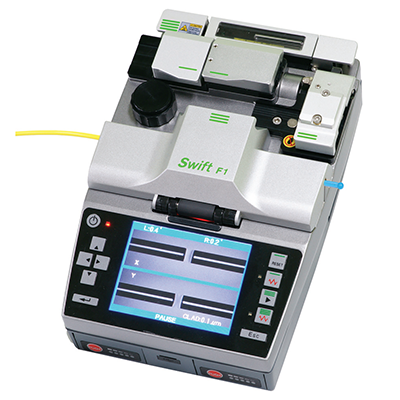 Swift F1 is the highly sophisticated and integrated clad alignment fusion splicer, which has been designed to perform the major 5 multifunctional features systematically: heating, stripping, cleaning, cleaving, splicing and sleeving. The Swift F1 has been designed for fusion splicing and splice-on connector (Swift Connector) of FTTH network applications. The structural and complementary features of Swift F1 have been applied to the design of Swift Connectors to resolve the problems of mechanical connectors in past: low quality, weak durability and high maintenance cost. Swift F1 has turned around the way that the connector users, who were used to thinking previously, as from the installation and maintenance costs of splice-on connector, had been more expensive than a mechanical connector to more cost effective than mechanical connector purchasing cost of splice-on connector. Swift F1 is a versatile fusion splicer which can perform all kinds of FTTH fusion splicing for the ordinary 0.25mm, 0.9mm, 2mm~3mm cable, indoor cable and others splicing connectors.